It was through LTH that I learned about a place called “24 hour korean” where I discovered a favorite dish of mine, but I didn’t know the dish’s name. For years after “24 hour korean” closed down, I was on the search for that dish. I even attempted, to no avail, to recreate it through recipes, soliciting the help of the forum. After years of searching I thought I may never locate that dish again. It turned out that I was looking in the wrong places, it isn’t served in Korean restaurants, but rather Korean bars! At the end of that 6 year long mission, I walked through a dark and uninviting door to discover the vibrant and warm bar, Dancen, and finally the elusive dish, Buldak. 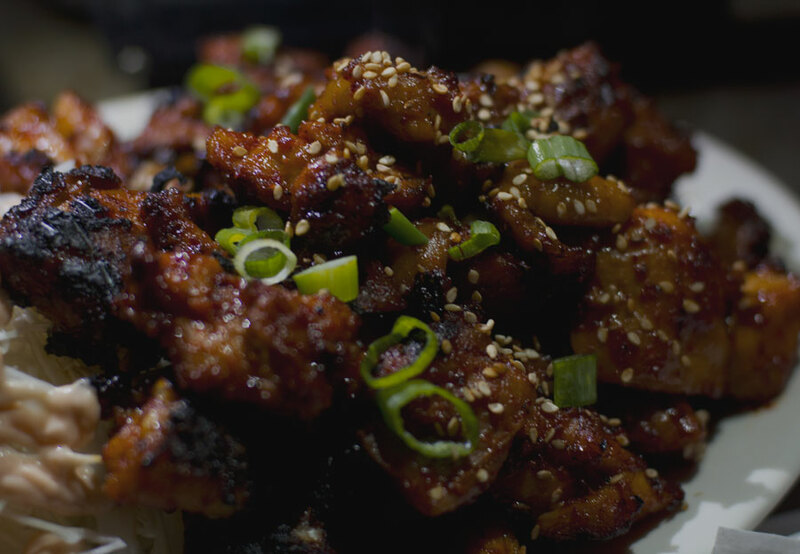 Buldak, or translated into English, “fire chicken,” is the dish that makes Dancen famous among the Korean community. Char grilled right in front of you by the bartender, the chunks of chicken are rich, savory, slightly sweet, and damn spicy, served with the equally charred bones on the side for you to gnaw on. Its rich spiciness is the perfect compliment to an ice cold pitcher of light Korean lager (or is it the other way around?) or a frosty yogurt soju. The thing is, as far as the food goes, the Buldak is just the tip of the iceberg. Korean bars serve up a number of unique dishes that you will never find in the typical Korean Restaurant. Dancen quickly proved the best among them all, serving up dish after dish, each outshining the last. More impressive than the fire chicken may be the modestly named “pork cartilage,” which is more like tender shaved pork with tiny bits of cartilage attached for a nice textural contrast. Spiced heavily with Korean perilla seeds and served with perilla leaves on the side for wrapping, is has a strong and very distinct flavor that you don’t find in many dishes. 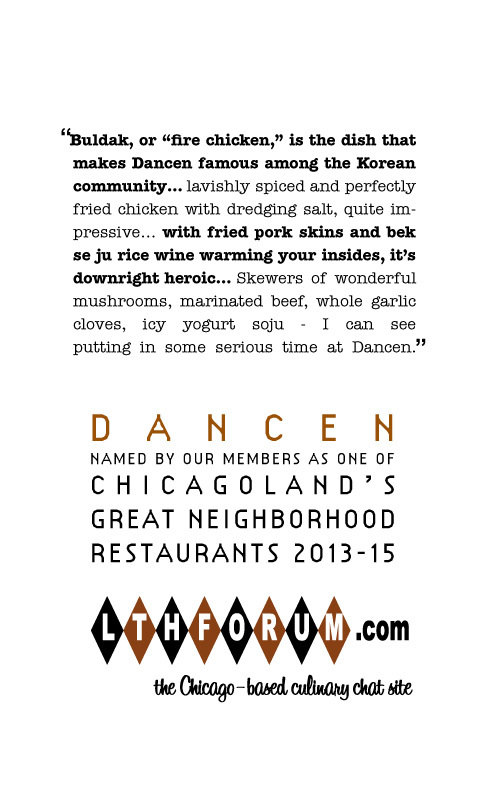 This is a dish which is a Korean bar staple, yet you'd be hard pressed to find at any other restaurant in Chicago. The “spicy cod roe soup” is another must-order item. 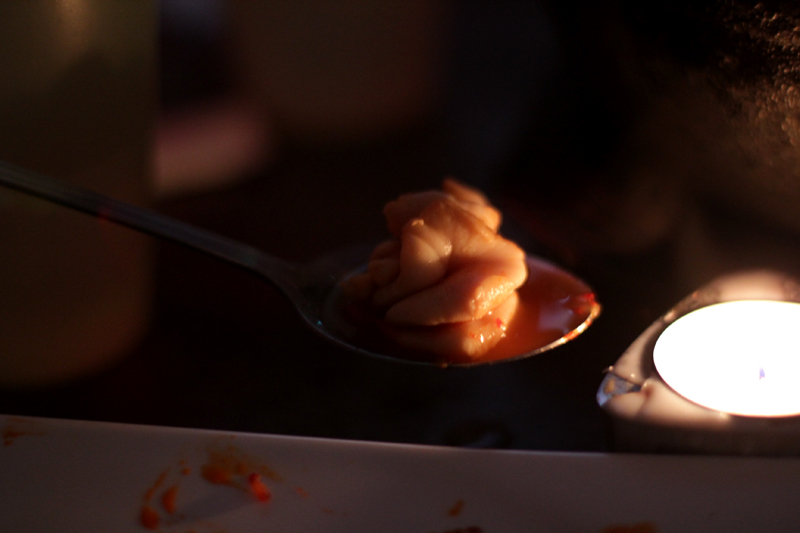 Served in a spicy yet clean and bright tasting broth, the cod roe sacks are not like any other I’ve ever tasted. While others are sometimes fishy or have a grainy texture, I can only describe this one as light and buttery, with a silken tofu like texture. It is a truly remarkable soup, currently fitting in among my favorites in the city. As for atmosphere, I’ll keep it short. With the K-pop music playing at all hours, magic marker drawings of cartoon pigs on the wall, and the tinted windows, once you step inside you are all but teleported directly to a dive bar in Korea. It is a great place to go get lost in the night and forget you live in Chicago. I recognize that Dancen hasn’t had much talk on LTH yet - hell it doesn’t even have a dedicated thread (I’ll have to start one, I suppose) - but this is a place that I’m very passionate about, and I believe if more people speak up or go out and try it, it’ll easily hold its own against this tough crowd. Dancen is an exciting and very unique place, but most importantly the food is astonishingly great. Love this place. It's dark, unpretentious, and the food is great. Very much support this GNR and will be on the look out for a potential outing. While I can't condone (or even comprehend) the gratis american cheese omelette, everything else about this place is fantastic. Really a gem, and a place I find myself missing from 800 miles away in Virginia. I'm all in favor of setting up an event, but would like to keep the head count lower this time. Last time it was about 10 people and we were taking up 1/2 the place. I'm thinking of splitting it into 2 events with between 5-7 people instead of one big one. I'll post back here when i setup the events so that anyone who subscribes can get a notification. The upcoming evenings of tuesday through saturday look pretty open to me, so if anyone is interested go ahead and PM me with which day/s would work best for you. I setup 2 events. Tonight, and Wednesday. Both at 8pm. Last edited by laikom on February 8th, 2013, 2:46 pm, edited 2 times in total. Truly a fantastic meal here last night. I'll comment more on it later in the Eating Out thread but I strongly support this nomination. Really a great gem. I look forward to a lot more outings here. Thanks to Laikon setting up a LTH get together at Dancen I got a peek into a narrow window of Korean food I was totally unfamilar with, drinking food. Hard not to enjoy crispy pork skin, pork cartilage with sesame leaf and slivered jalapeno right up my culinary alley, all set to K-Pop, dark lighting and late hours. Was fun, unusual, delicious and I support Dancen as a GNR. My sole visit here was one stop of many during a bachelor party in mid-2012, so even though I don't remember a ton of details about the individual dishes we ate, I do remember enjoying the food a lot and having a great time (and isn't that exactly the point with this place? ). There were lots of chewy, funky, boldly-flavored and well-charred little bits that made for perfect drinking fare. I love the idea of Dancen being on the GNR list and support the nomination.